- Nearly 500 hours of training. - First and second age-group wins. - First half-iron distance tri. - First-place finish Try Sports Triathlon Development Series, Women 30-34. - Over $6,350 raised to support Genesis Home. - More than 130 blog posts documenting the journey and more than 5,981 unique visitors following along. I'm calling 2008 a grand success! Thank you for being part of it. "The road ahead will be long. Our climb will be steep. We may not get there in one year or even one term, but America -- I have never been more hopeful than I am tonight that we will get there. I promise you -- we as a people will get there. "- President-Elect Barack Obama. What an amazing year to be alive and engaged in making the world better for all of us. The final Tri to End Homelessness fundraising numbers are not yet in, but I do know that at the least, we came very, very close to the goal of raising $7,300 in recognition of the 70.3 miles I covered on Saturday. As I begin to think about the close of the formal Tri to End Homelessness initiative, I know that the work ahead remains. We've learned about homelessness in our communities. We've gotten to know some of the homeless families living at Genesis Home. We've taken action. And we can all continue to do so. Here's how. 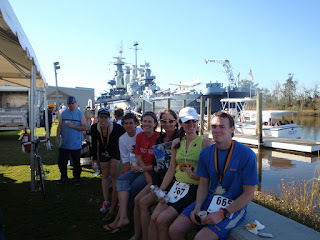 Racing the Beach 2 Battleship Half-Iron Triathlon was the hardest thing I've ever done. Now, three days later I am still overwhelmed with a sense of pride, satisfaction, and gratitude. The fulfillment I feel after setting a big, audacious goal, working every day toward its accomplishment, and coming out on the other side is the reason I love this sport. After exchanging approximately 1,982 logistics emails, my family and Sage Endurance teammates arrived in Wilmington on Friday afternoon. After a smooth packet pick-up and pre-race meeting, we headed to Wrightsville Beach to check-in our bikes and gear for race day. Because of the point-to-point swim and two separate transitions areas, this race was the most logistically complicated one I've run. I checked-in my bike and swim-to-bike gear at T1, dropped off my bike-to-run bag, and left hoping that I'd remembered everything! 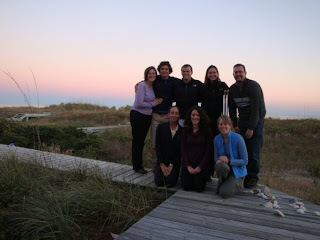 Thanks to the generosity of a Sage Endurance friend, our team reconvened at our home base for the weekend: a gorgeous beach front house on Figure 8 Island. After dinner, sunset, and a last minute check-in, we headed off to bed. 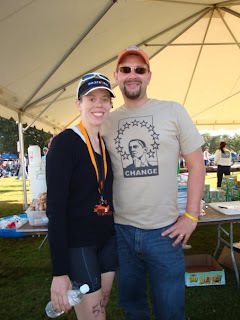 After waking at 4:30 a.m., downing my pre-planned breakfast, driving with my teammates to T1, setting up transition wearing my headlamp, hitting the port -o-potty a few times, and dropping off my post-event bag, I was finally on the bus from T1 to the swim start -- and I was not at all nervous. I was calm, ready, and excited to finish this incredible journey. Our team huddled for warmth on the sound-side beach, watched the full-iron athletes pass by us on their swim, and waited as long as possible to take off our warm-ups and get in the water. After singing the national anthem and taking time for a group hug, it was time to go! The horn sounded and it was time to face the chilly sound. To some, 60-ish degree water temperature is not cold, but to me it's absolutely FREEZING. It took a few strokes, but I caught my breath, put my face in, and quickly got caught up in the fast current. From there, the swim was uneventful -- quiet water, a bit crowded, the sunrise to my right, a beautiful setting. My complete focus was on GETTING DONE and GETTING WARM. Thanks to the current, I swam faster than ever and covered 1.2 miles in just over 34 minutes -- much faster than my anticipated 40. 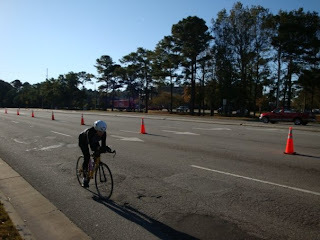 ... and with that, my wetsuit was in my hand and I was running into transition: ~300 yds on cold asphalt with numb feet! Get me to my socks! On the way in, I gave my husband a high-five and quickly found my rack position. Before the race, what to wear on the bike was a big question for me. After that swim, I had no doubts about giving up a few minutes to put on a few light layers of my cold weather gear. 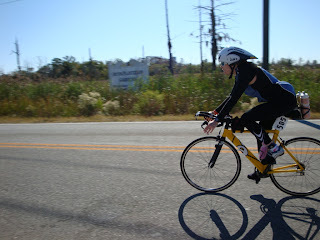 I took a deep breath, wiped down my arms and legs, pulled tights over my tri shorts, pulled on a bolero, zipped up my wind vest, struggled to get my fingers into gloves, donned socks, shoes with toe covers, sunglasses, helmet, bike, GO! The best part of Saturday's 70.3 miles were the 56 I spent on my bike. I felt incredibly fast, powerful, and alive! All of my training paid off during this stretch of the race. From the time I got on my bike until the time I crossed the finish line, I was completely in the zone. I rode in my big chain ring, stayed aero, followed my nutrition plan, and barely noticed the world around me. The course was a mostly flat out and back that included a few bridges. Early on, we crossed two grate-like bridges that race officials had covered in indoor / outdoor carpet to ease the riding. None the less, my wheels were quite squirrelly on them and my heart rate definitely went up as I safely navigated my way across. Following the bridges, the road surface was 85% very, very good -- with the exception of several road seams in the last third of the course. Later, throughout the course's rural section we passed several hunters who looked very confused as we zoomed by. I distinctly remembered thinking, I hope they're firing into the woods and not across the road! I reached the course U-turn and enjoyed giving a shout-out to several of my teammates as I headed back into town. Reaching mile 46 was special. My #1 worry preparing for the race was having to face bike mechanical issues. When I only had 10 miles between me and T2, I knew that, if I had to, I could walk/run my bike in and still finish the race before the cut-off. With about 5 miles left, I realized that I was on target to finish the bike leg in under 3 hours. At the moment of this realization, it became my only goal. I started passing people - a lot of people! Going up the last bridge to transition, I probably hammered too hard, but in the moment, I didn't care. I just kept thinking GET ACROSS THAT MAT IN UNDER 3! Making the turn for T2, I finally sat up, saw my family and friends cheering like wild animals, and began to remember how in the world to dismount my bike. The transition volunteers were again amazing. At the dismount line, they called me by name, took my bike and helmet for me, and directed me to bike-to-run bag. Thank you volunteers! This time, changing was much faster. Hat, belt, shoes, nutrition and I was quickly headed out to the road. On the way, the woman in the picture below who is in my age group asked what pace I was planning to run. I mumbled something and she responded, "Oh, you can go faster than that." Ha! I chuckled and sent her on her way. Go, girl. Just after the turn out of transition, we began climbing the first bridge on this rolling course. In past races, this type of hill has been demoralizing, but on Saturday it didn't phase me. No, I wasn't having the run of my life. Far from it. I simply needed to use the bathroom so badly that I was COMPLETELY focused on getting to the aid station and port-o-potty at mile 1. Feeling relieved, I headed out across the second bridge and into downtown Wilmington. Then, things got dark. Very dark. Oh, the weather couldn't have been better, but internally, I was struggling. Miles 2 to 5 were probably the hardest I've ever run. At mile 3, I face a short, steep hill and decided to walk it. I took on step, stuttered a bit, and immediately thought "Uh, oh. This could be a LONG half-marathon." While walking up the hill, I passed another racer who was also walking. He laughed and said, "Geez! You can't pass me while you're walking!" That gave me the lift I needed to start running again. During our pre-race meeting, Sage had warned our team that the first 5 miles might feel bleak. I remembered that and kept repeating, JUST GET TO MILE 5. My stomach was cramping badly (perhaps too much time in aero bars on the bike?) and I couldn't get down the Hammer Gels I'd planned. Instead, I switched my strategy and simply alternated between water and Hammer HEED at each aid station. At mile 5, the course moved on to a shaded bike path surrounding a lake. Between miles 5 and 6, Sage and my teammate Julee caught up to me on the run. Julee went ahead, but Sage decided to run with me for a bit. I was mostly non-verbal, but did manage to eke out "Thank you for running with me." Sage responded with "Don't worry. I'm here," and I knew I could get this done. From there my spirits picked up. Sage and I caught another teammate, and she ran with her as I went on ahead one aid station at a time. Never before have I been so internally focused, so completely in the moment. I did not notice the scenery around me. I did not hear the spectators. I barely heard my own breath. My mind was completely blank and was only occasionally interrupted with Be Relentless. It was truly an out of body experience. Before I knew it, a volunteer was directing me to turn for home. From behind, I heard Sage yell, "You're doing it, Robyn!" 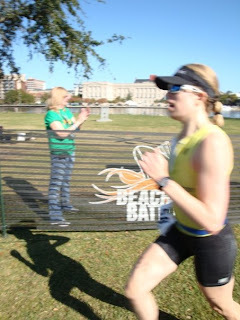 Ahead, I saw my sister jumping up and down, screaming, "I promise the finish is right around this corner." I heard my brother-in-law Dave (who'd already finished his own race with a PR and 9th place overall!) say, "Turn the page, Rob, turn the page!" And then I saw the finish line. During my last few training runs, I'd become emotional just thinking about this moment. But when it was finally here, the tears did not come. I had simply given everything I had to give out on the race course. I had nothing left. I crossed the line, raised my arms in the air, accepted my medal, and stumbled toward the medical personnel who asked if I needed some assistance. I mumbled "Just a second," and a woman walked me out of the shoot to sit down while she poured a bottle of water over my head. I opened my eyes, saw my family and coach standing there, thrust my fist up into the air, and felt amazing. After six hours, two minutes, and thirty-six seconds of going for it, I crossed the line completely content. I finished this distance for the first time, met my time goal and came satisfyingly close to my radical goal. My swim and bike were much faster than I'd planned and my run was much slower - but in the end, I left it all out there. And JR and MC who are transitioning out of foster care and into adult life on their own. I and we and they can do amazing things. Thank you to Ryan, Rachel, Sandy, Claire, Natalie, Dad, and Mom for being extraordinary cheerleaders. Thank you to Dave, Derek, Julee, Katy, and Sage for sharing this incredible experience with me. 6:02:36 and very, very happy! Full race report to come.